Sure Marie, I have my ribbons ready and will be sure to take a before and after pic! So.... do you have the ribbon Jessica??? I mailed them out to her, I hope they have arrived by now! I'm sure she'll be on soon to reassure us! Probably getting her bambinos into bed! They came two days ago! Thanks for all the nice ribbons, Tams! Looking fprward to checking it out! So pretty! Love thos polka dots, Jessica. 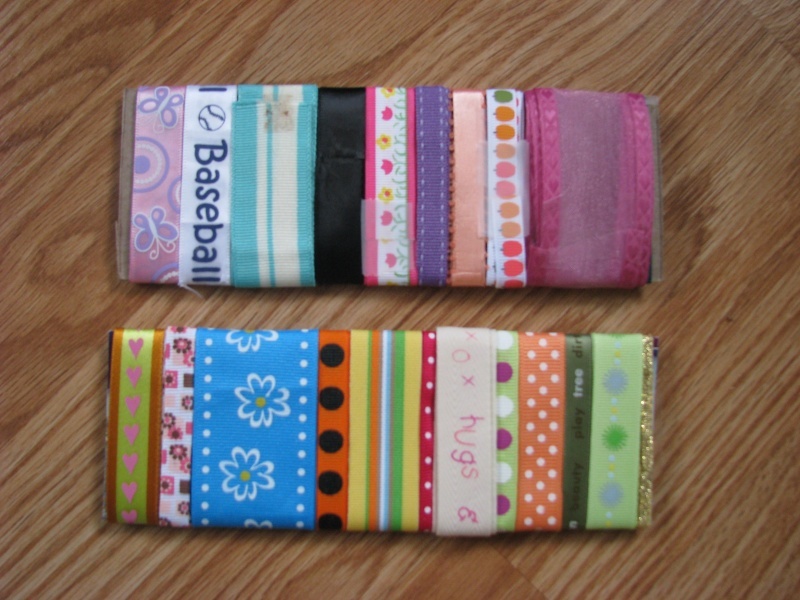 Can't wait ot see you use them..
Just wondering if anyone would be interested in doing a ribbon swap. I would start it and it would get sent around to anyone who signs up and at the end get sent back to me. I would include up a number of 12 inch pieces of ribbon and as it goes from scrapper to scrapper you can remove ones that you like and then replace it with another one. Would anyone interested in doing something like this? Wowsers... can't wait to get them soon! Received it today, the swaps has been made. It looks like this now. In about an hour, it will bein Canada Post's hands and off to you --- Helen! I am liking that butterfly one! It will be off to Kelly tomorrow am!! Loving how it changes! I think it changed the most with Jessica....she swapped out every single piece! LOL WTG! Can't wait to see what comes to me! No... the return addres was Jessica... hmmm... oh Jessica.. did you send this??? No. I sent it to Linda! She must have forgot to change the return address on it! LOL! LOL.. I thought of that after I looked at the envelope again.. thanks Linda! I mailed it off to Kelly... you will have to wait for Canada Post to send it on Kelly! LOL!!! I didn't forget, I just didn't do it!!! I used the same envelope and my address labels are all gone. I just thought, if it strays somewhere, it could go back to Jessica!!! hahaha to funny! Good thinking though! Subject: Re: SWAP - SIGN UPS!!! !